The USS New York was originally called “New York” but renamed to “Saratoga” during World War I. Some time later it was rechristened the USS Rochester. Since being scuttled, USS New York has been transformed into an artificial reef. 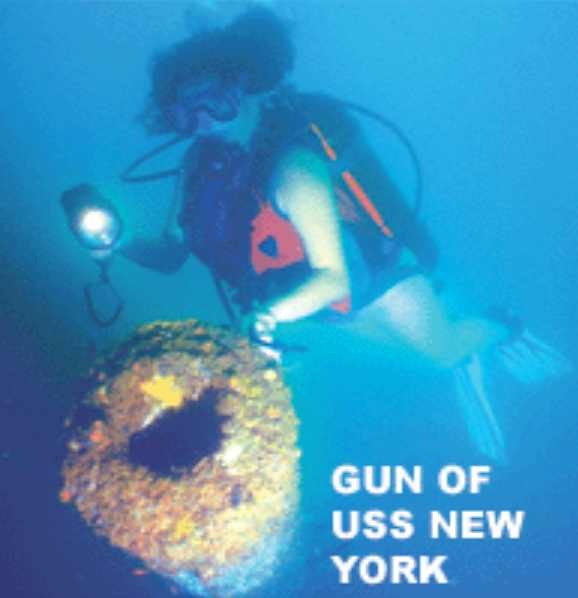 USS New York is today one of the most dived ship wrecks in Asia, given her somewhat shallow depth of 16–32 meters (52–105 ft.). The wreck can be dived by most divers due to its ease of access. Basic Divers – A beginners dive site. 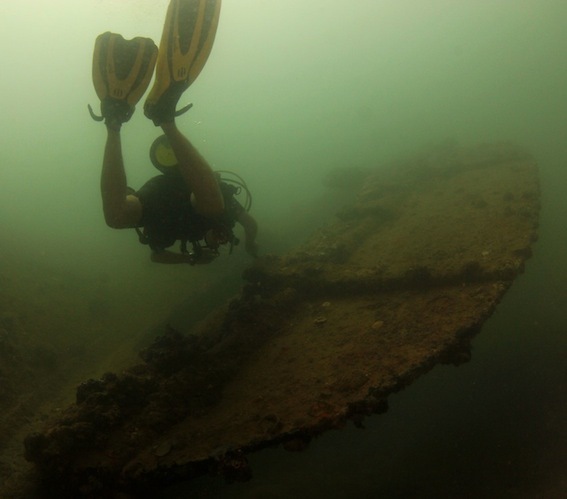 The site allows divers to have a nice look at an historical wreck. Within the range, you can examine the barrel of an 8 inch (200 mm) gun at the depth of 18 meters (59 ft.) and then continue the dive to explore marine growth between 14-18 meters (46–59 ft.) depth. The 110 meters (361 ft.) length gives plenty of area to observe as corals, sponges and fish life have had over 60 years to convert it into their home. Apart from the wide variety of different Coral fish, both Scorpionfish and Stonefish are common around this wreck, however, divers should be reminded that contact with these fish is very dangerous. At times we also get close encounters with majestic Eagle Rays roaming the site. Experienced/Advanced Divers – More advanced divers can explore the propeller, conning tower and deck areas. The mess deck has an interesting swim of 60 meters (197 ft.) with portholes above allowing light to enter the spaces, but no exit. Wreck Divers – There are some other areas for the experienced wreck diver. The boiler room can be explored on a single tank. 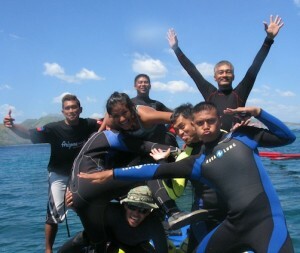 We offer both Wreck Diver Courses and Advanced Wreck Diver Courses conducted on all of the wrecks within Subic Bay. The courses are held on a one-to-one basis but can also be done in groups of two students and one instructor. Advanced Wreck Divers – Those who can dive beyond recreational limits can access the engine room and machinery spaces. These are in excellent condition, with huge pipes, machinery and valve wheels. Penetration is generally made on twin tanks, with reel and advanced wreck diver training. Both engine room entrances are posted with notices warning of the dangers to the untrained. We work closely with some of the best Technical divers in Subic Bay and are happy to assist you should you be interested in advanced wreck diving. The USS New York offers plenty of exploration opportunities. The starboard side of the ship has been badly damaged, but several corridors remain intact, and you can explore them. There are also several decks, including one where you can see the barrel guns. Visit the “Spanish American War Centennial Website” for a more detailed description of this wreck. “We have confirmed there are four engine rooms, all separated by watertight bulkheads. We have confirmed that all four engines are still in place. All major components are still present in the wreck, although connecting pipework has been largely removed (or perhaps broken off due to shifting or equipment in wreck)“. More history of the USS New York. As the United States drew closer to participation in World War I, Saratoga commissioned in full 23 April 1917, and joined the Pacific Patrol Force 7 June. 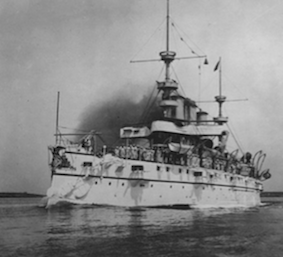 In September, Saratoga steamed to Mexico to counter enemy activity in the troubled country. At Ensenada, Saratoga intercepted and helped to capture a merchantman transporting 32 German agents and several Americans seeking to avoid the draft law. More pictures of the USS New York can be viewed thru both NavSource Online (Cruiser Photo Archive) keyword - USS New York/Saratoga/Rochester (ACR/CA 2), or thru the Department of the Navy - Naval Historical Center, keyword – USS New York.